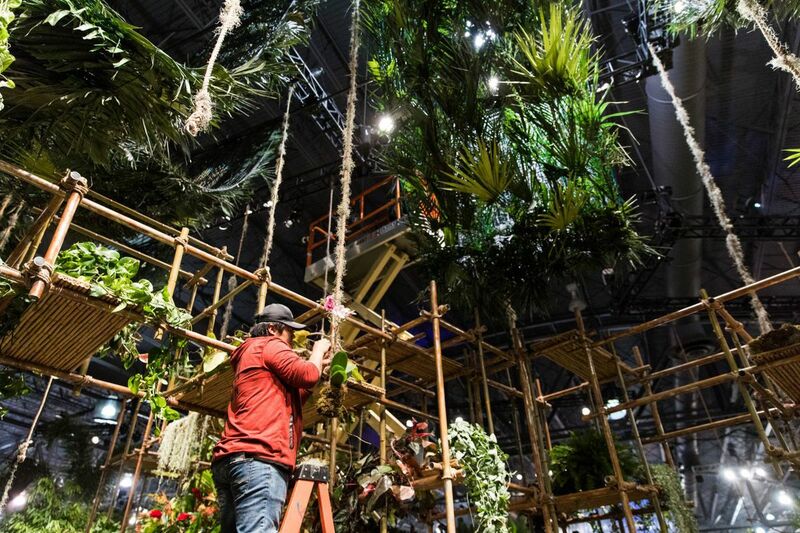 A mass of plants and flowers is set up on Wednesday morning, Feb. 28, 2018, for the Philadelphia Flower Show at the Pennsylvania Convention Center. The Flower Show is back this year, ready to delight visitors with thousands of tropical blooms and plenty of water features in the Pennsylvania Convention Center (1101 Arch St.) from Saturday, March 3, through Sunday, March 11. Here's a list of events, attractions, and tips you won't want to miss. SEPTA is keeping its ticket offices open for extended hours throughout this week to give people time to purchase fares for the Flower Show. It also is offering a break from the Flower Show's box office ticket prices. Discounted tickets — $33 for adults and $17 for children — can be purchased at SEPTA's transit and Regional Rail ticket offices. Quiet cars will be eliminated during the Flower Show due to expectations of higher ridership. SEPTA is recommending visitors to the show buy the One Day Independence Pass at $13 a person or a Family Independence Pass for $30, which covers unlimited travel for a family up to five people throughout a day. This year's Flower Show entrance garden features a 25-foot-tall waterfall, a rain curtain, misting pools and tons of tropical flora. Stop by to check out a selection of plants from amateur and professional growers alike, including the ribbon-winning ones this year. Munch on light refreshments and sip tea while immersed in a garden. Seating is assigned in groups and same-day admission is required. In the Designer's Studio, top floral designers from around the country go head-to-head in this lively competition. Audience members also can compete under the guidance of a designer. In addition, learn the best floral design tricks from experts that you can use in your everyday life. Don't miss the Gardener's Studio, where you can pick up tricks and tips for your own garden from gardening gurus and best-selling authors. See and feed more than 1,000 butterflies of more than 20 exotic and domestic species as you walk through the pollinator garden. Calling all photo enthusiasts: Nationally renowned photographers are leading early-morning tours at 8 a.m. and providing the best tips and tricks for you to get the best shots of the flowers. They'll also show you the best areas of the show for photos, and the package includes same-day admission to the show. The Flower Show is once again opening its doors to all four-legged friends on Friday. Yappy Hour will be from 6 to 9 p.m. and PAWS will be hosting a silent auction with dog-friendly gift baskets. Dogs must have tags with proof of current rabies vaccine and may not use the escalators, due to safety reasons. The Pennsylvania Horticultural Society and the William Penn Foundation are leading the show's first Water Summit, a daylong exploration of freshwater issues and possible solutions with environmental and industry experts. Keynote speakers include astronaut Mary Ellen Weber and Robert Irvin, the president and CEO of American Rivers. The Flower Show is open from 11 a.m. to 8 p.m. on Saturday, March 3, 8 a.m. to 9 p.m. on Sunday, March 4, 10 a.m. to 9 p.m. Monday through Friday, March 5 to 9, 8 a.m. to 9 p.m. Saturday, March 10, and 8 a.m. to 6 p.m. Sunday, March 11. Members' preview hours are from noon to 3:30 p.m. on Friday, March 2, and 8 to 11 a.m. on Saturday, March 3. Advance tickets cost $29.95 for adults, $20 for students ages 17 to 24 and $17 for children ages 2 to 16. During show week, tickets purchased online at theflowershow.com cost $32 on weekdays and $35 on weekends for adults, $22 on weekdays and $24 on weekends for students and $17 for children. At the box office, tickets cost $35 on weekdays and $40 on weekends for adults, $24 on weekdays and $26 on weekends for students and $19 on weekdays and $20 on weekends for children.